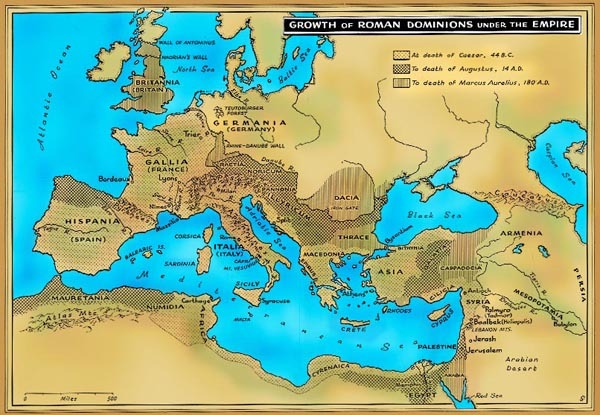 It has been estimated that the Roman empire had a total population of roughly 4-5 million individuals in the first century BCE. Most lived in rural areas, but there were cities scattered throughout the empire that boasted as many as 10-20,000 inhabitants. More mechanicians than theoreticians, the Romans viewed engineering in a more practical light than the Greeks. They funneled financial, material and human resources into their city centers. They planned and built public buildings -- basilicas, gymnasiums, theaters, baths and temples --of concrete veneered by marble. They devised heating systems to keep provincial officials comfortable in the cold climates of distant outposts. 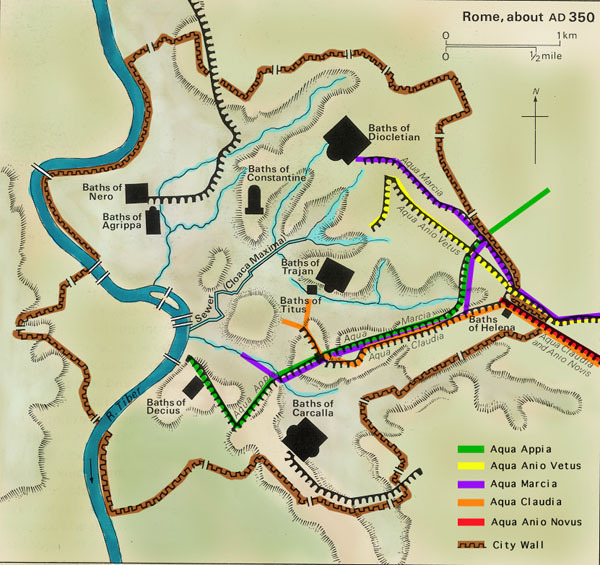 They built systems of sturdy roadways to ease the burden of travel and speed up communication between Rome and its satellite cities. And they developed a complex array of aqueducts to bring fresh water to thirsty urban residents. 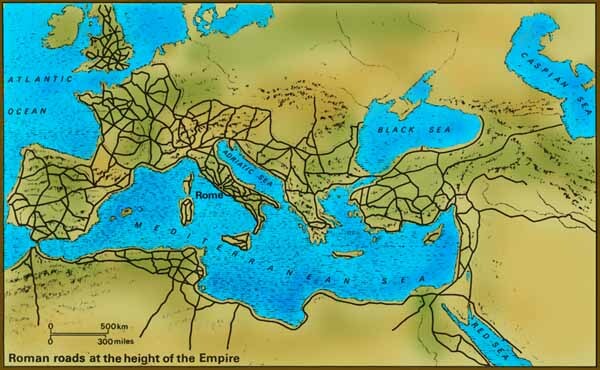 The network of roads connecting the expansive Roman Empire were built to last. Everywhere they went, the road builders encountered different conditions which presented them with a wide array of design challenges and opportunities. Of utmost importance was the road's foundation (statumen). A weak foundation would always result in endless and costly repairs. 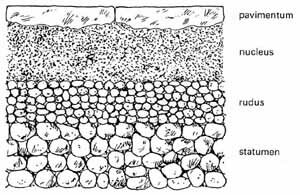 Hard soil or rocky surfaces often needed very little foundation, while soft soil required a substantial layer of packed rubble. To build a road across a marsh or bog, a row of wooden piles would have to be driven along each edge of the road's proposed path to keep the statumen from shifting. Roads between towns and cities were built along relatively direct routes. They were made for marching men rather than pack animals or vehicles hauling heavy loads. The aqueducts in the city of Rome. 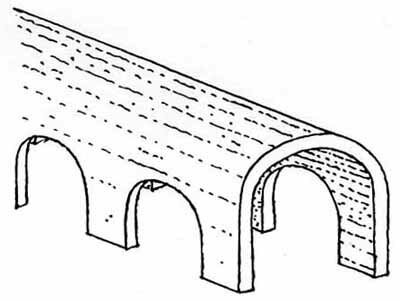 Building an aqueduct required extensive planning. After a source was identified, surveyors determined the difference in elevation between the source and destination and laid out the most efficient route for the water channel. 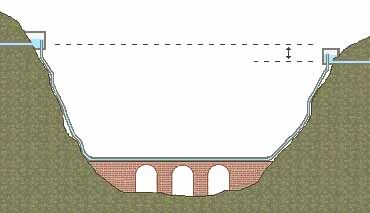 Work on an aqueduct was begun simultaneously at several points along the route. Workers slept and ate in camps. Being isolated for long periods from sources of food and shelter required self-sufficiency. At each work station, workers removed topsoil, leveled bumps, filled hollows and dug tunnels. At each step of the way, they checked and rechecked the slope of the grade. They rammed stone into soft ground where necessary to make a temporary road for pack animals and carts. Stone used in constructing the aqueduct was taken from nearby quarries along the route rather than hauled long distances. The stones had to be dressed by skilled masons on site in order to ensure a close fit. Mortar based on a mix of three parts pozzolana (ash from prehistoric volcanic eruptions) and one part lime was used to seal joints. Once a portion of the channel was complete, it was roofed and covered over to prevent detection and theft of water. Surveying instruments like the dioptra, levelling staff were essential in laying out a proposed path for a new aqueduct. Zig-zagging along the sides of hills was one way to maintain a constant downward slope for the water channel. 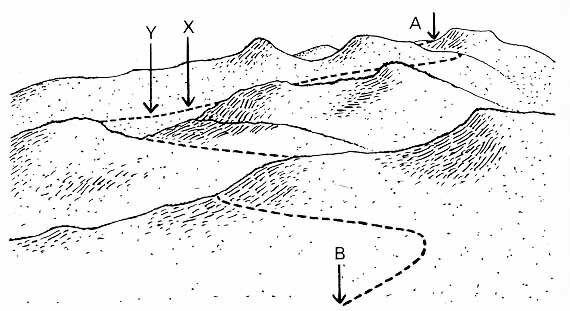 But sometimes it was more efficient to create a shortcut across valleys or through hills. 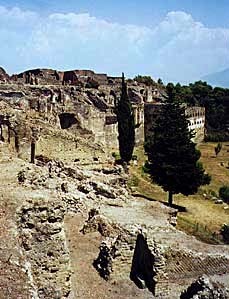 Pompeii is a Roman city that, as a result of the disastrous eruption of nearby Mt. 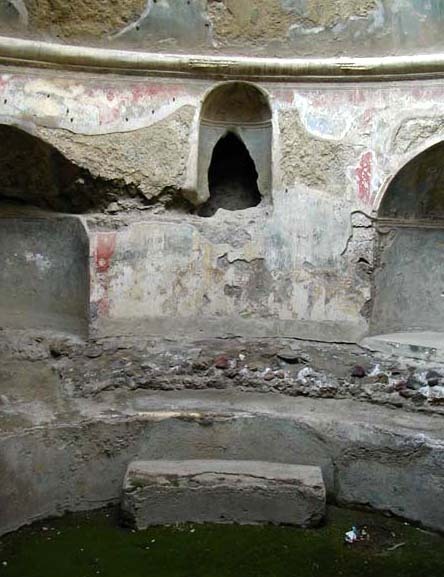 Vesuvius in late August 79 CE, has been preserved allowing us to see the kind of structures that Vitruvius describes in his book On Architecture. Buried for centuries under about 12 feet of pebbles, pumice and ash, the long-forgotten city was re-discovered in 1748. Since then, archaeologists have excavated and even restored large parts of the city. Plaster casts reveal the frozen forms of Pompeiians who died while attempting to flee the hail of pebbles and ash. 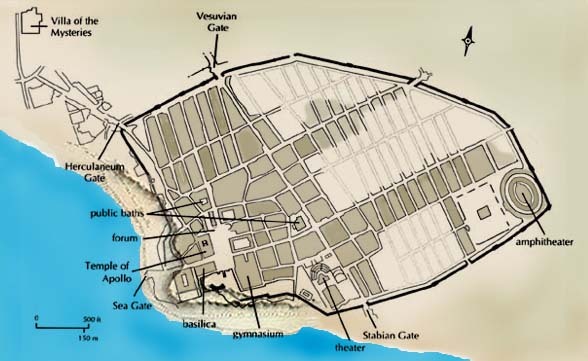 The eruption claimed roughly 2,000 victims -- 10% of Pompeii's residents. Those who escaped left in the early phase of the eruption. The Vesuvian Gate; A tranquil Mt. Vesuvius can be seen in the distance. Built high on a cliff overlooking the Mediterranean, the walled city of Pompeii afforded its residents security from enemies. 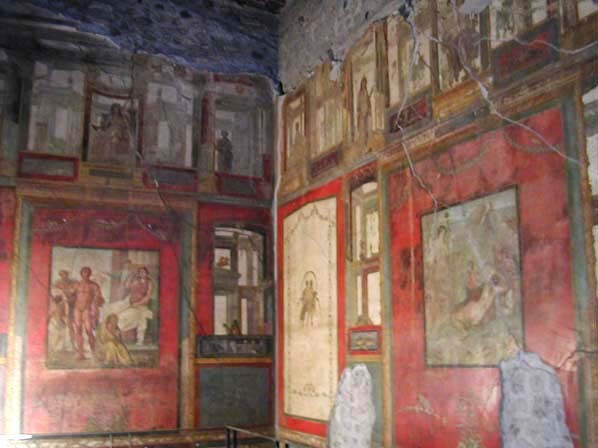 Pompeiians lived and worked in spacious, aesthetically pleasing, well-ventilated structures. And they made use of their city's convenient and ample public facilities for leisure and entertainment. A mill for grinding grain. 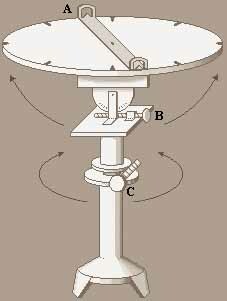 The mill is comprised of two massive pieces: A cone-shaped base and a funnel-shaped top for holding the grain. The funnel has two rectangular holes on either side into which long wooden beams were inserted so that granary workers could turn the stone on the stationary base thus grinding the grain as it flowed between the two stones' surfaces. Three grinding mills. One cone-shaped stationary base remains without its funnel-shaped grinder top. Tiled entry to a Pompeiian home. 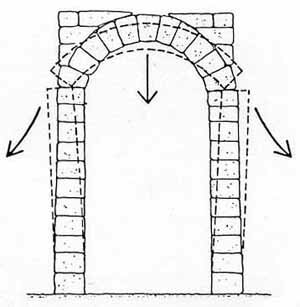 Simple arches can be found in structures built in Mesopotamia in the 3rd millennium BCE. But the Romans made this versatile architectural form their own, successfully incorporating it in all sorts of building projects from gates and bridges to aqueducts and colosseums. 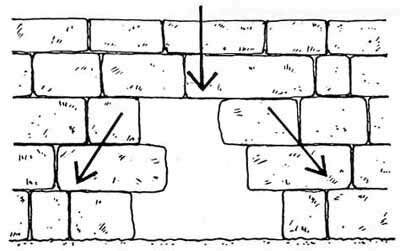 A stone wall can sometimes maintain its stability even if some of the lower supporting stones are removed. 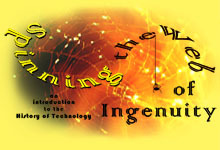 Perhaps observant individuals in the past noted these serendipitous events and were inspired to replicate them by design. 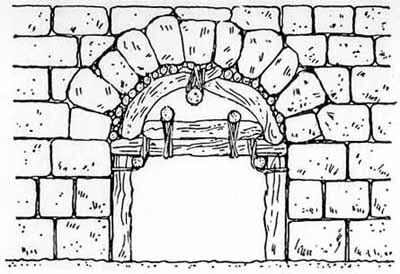 The weight of the stones in an arch push downward and outward. Some additional bracing is needed to prevent the supporting columns from collapsing. ...or by creating a colonnade in which each arch's outward thrust counteracts that of its immediate neighbor. Around the first century CE, the Romans discovered that the arch could be rotated on its axis to produce a stable structure, or dome. 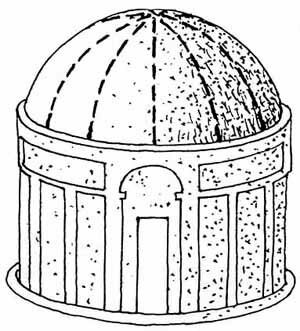 No vertical beams are required to hold up a dome roof because it is supported entirely by its encircling cylindrical wall. The open and unobstructed space within a large domed building is quite a remarkable and awe-inspiring sight. Colonnades create a sturdy and airy structure for the Roman Colosseum. Built between 75-80 CE, the Colosseum is an oval that is 188 m long, 156 m wide, and 52 m high. Its capacity has been estimated at 50,000-87,000 spectators. Additional arches line the Colosseum's interior. The slanted surfaces near the bottom of the photo as well as the piers stretching across the middle of the picture are what remains of the supports for spectator seats. Some of the Colosseum's few preserved marble seats. An overview of the Colosseum's interior. The oval area which the seats enclose was covered with a wooden flooring. Now that the floor no longer exists, we can see the maze of chambers and corridors that comprise the workspace below it. It was in these chambers that animals were held and gladiators prepared for battle. A shaft for an elevator operated by a clever system of pulleys to raise wild animals to a trap door in the floor of the Colosseum where they could be released. Inside the Pantheon in Rome. The building as it exists today was built from 120-124 CE. The dome was the largest structure of its kind in the world until Filippo Brunelleschi (1377-1446) completed of the dome of Florence's Santa Maria Del Fiore in 1436. 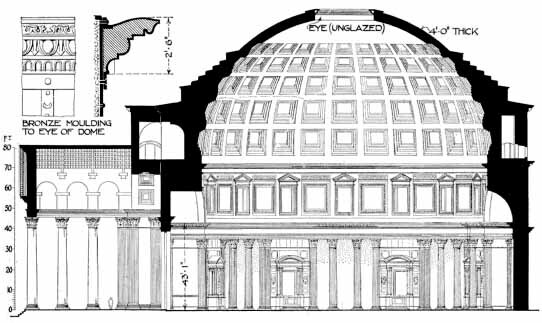 The Pantheon's dome is 43 m high and 43 m in diameter. Its thickness tapers in order to lighten the load that must be born by the walls. At the center of the dome is an 8 m opening (oculus), a feature that adds to the spectator's experience of wonder at how the structure remains standing! The Basilica of Maxentius at the Forum in Rome was built from 306-312 CE. This arch is the centerpiece of three side-by-side arches, each 35 m high. The spectacular colonnade constituted one of the long sides of a large rectangular building called a "basilica" [from the Greek word basilike, meaning a royal portico] used for business and judicial proceedings. Today the word "basilica" is used to refer to large cathedrals because they were built on the same structural model.